"This delicious dish covers tender carrots with a delicious butter, orange, and ginger sauce." Bring a pot of lightly salted water to a boil in a saucepan and cook carrots in the boiling water until just tender, about 15 minutes. Drain. Transfer carrots to a serving dish and keep warm. Whisk sugar, cornstarch, salt, and ginger in a saucepan until thoroughly combined; turn heat to medium and whisk in orange juice. Bring to a simmer, whisking constantly, and cook until sauce is smooth and thickened, about 3 minutes; stir in butter. 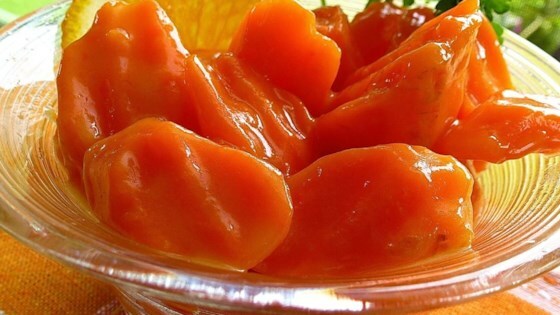 Pour sauce over carrots, stir to coat, and serve. Brown sugar and chopped dates add a sweet counterpoint to spicy gingered carrots. Too much butter. This was an interesting change to the brown sugared carrots and I liked the citrus flavor. Thanks for the recipe though. Made this to take to Christmas Eve dinner and even my carrot hating husband liked it. So simple and yet so great. Sauce is thick so we just added more orange juice. Lovely taste.